More than 50 years ago, Gord Slightham, a successful home builder by trade, had a vision to build a different kind of real estate company. Along with his son Ted, Gord opened the doors to Slightham Real Estate in 1965. While the name has changed, Gord and Ted’s vision remains as clear as ever: to create “An Exceptional Experience” for its real estate clients and an environment of success and support for its Realtors. Over three generations, this vision continues to grow, and today, under the progressive leadership of Gord’s grandsons Chris and Jeff Slightham, the organisation has crystallized into a symbol of professionalism and pride. As a result, Royal LePage Signature Realty is recognised as a leader in greater Toronto real estate and a place where real estate professionals can grow and achieve their own personal vision of success. When people believe in themselves, there's no limit to what they can accomplish. Our goal is to provide every tool necessary for our realtors to meet and exceed their expectations. 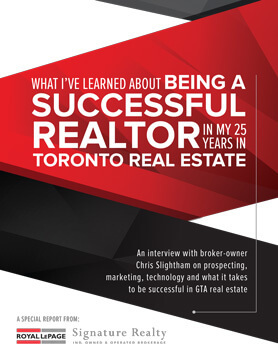 In this information packed interview with respected broker/co-owner Chris Slightham, he shares insights on prospecting, marketing, technology and what it takes to be successful in GTA real estate. Agent Lisa Taliano loves to be part of the Royal LePage Signature family. She says the company is “professional, wonderfully supportive and a great team of people.” She says you’ll find great energy, a strong sense of camaraderie and a true team culture. She knows she can represent her clients at the highest level because she is with a team that stands behind her.